Born of second generation German immigrants on May 26, 1895, at 1041 Bloomfield Street, Hoboken, New Jersey, Dorothea Lange was named Dorothea Margaretta Nutzhorn at birth. She dropped her middle name and assumed her mother's maiden name after her father abandoned the family when she was 12 years old, one of two traumatic incidents early in her life. The other was her contraction of polio at age seven which left her with a weakened right leg and a permanent limp. "It formed me, guided me, instructed me, helped me and humiliated me," Lange once said of her altered gait. "I've never gotten over it, and I am aware of the force and power of it." Lange graduated from the Wadleigh High School for Girls  and was educated in photography at Columbia University in New York City, in a class taught by Clarence H. White. She was informally apprenticed to several New York photography studios, including that of the famed Arnold Genthe. In 1918, she left New York with a female friend to travel the world, but was forced to end the trip in San Francisco due to a robbery and settled there, working as a photo finisher. By the following year she had opened a successful portrait studio. She lived across the bay in Berkeley for the rest of her life. In 1920, she married the noted western painter Maynard Dixon, with whom she had two sons, Daniel, born in 1925, and John, born in 1930. With the onset of the Great Depression, Lange turned her camera lens from the studio to the street. Her studies of unemployed and homeless people, starting with White Angel Breadline (1933) which depicted a lone man turned away from the crowd in front of a soup kitchen run by a widow known as the White Angel, captured the attention of local photographers and led to her employment with the federal Resettlement Administration (RA), later called the Farm Security Administration (FSA). In December 1935, she divorced Dixon and married economist Paul Schuster Taylor, Professor of Economics at the University of California, Berkeley. Together they documented rural poverty and the exploitation of sharecroppers and migrant laborers for the next five years – Taylor interviewing and gathering economic data, Lange taking photos. Lange took the photo Migrant Mother in California in 1936. Lange captured the mother and her children's feeling of lost hope for the future. Lange was awarded a Guggenheim Fellowship in 1941 for her photography work. From 1935 to 1939, Dorothea Lange's work for the RA and FSA brought the plight of the poor and forgotten – particularly sharecroppers, displaced farm families, and migrant workers – to public attention. Distributed free to newspapers across the country, her poignant images became icons of the era. One of Lange's most recognized works is titled "Migrant Mother." The woman in the photo is Florence Owens Thompson. The original photo featured Florence's thumb and index finger on the tent pole, but the image was later retouched to hide Florence's thumb. Her index finger was left untouched (lower right in photo). After Lange returned home, she told the editor of a San Francisco newspaper about conditions at the camp and provided him with two of her photos. The editor informed federal authorities and published an article that included the photos. As a result, the government rushed aid to the camp to prevent starvation. According to Thompson's son, Lange got some details of this story wrong, but the impact of the picture was based on the image showing the strength and need of migrant workers. Twenty-two of the photographs she took as part of the FSA were included in John Steinbeck's The Harvest Gypsies when it was originally published in San Francisco News in 1936. 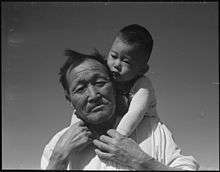 Grandfather and grandson at Manzanar Relocation Center. In 1941, Lange was awarded a Guggenheim Fellowship for achievement in photography. After the attack on Pearl Harbor, she gave up the prestigious award to record the forced evacuation of Japanese Americans from the West Coast, on assignment for the War Relocation Authority (WRA). She covered the internment of Japanese Americans and their subsequent incarceration, traveling throughout urban and rural California to photograph families preparing to leave, visiting several temporary assembly centers as they opened, and eventually highlighting Manzanar, the first of the permanent internment camps. Much of her work focused on the waiting and uncertainty involved the removal: piles of luggage waiting to be sorted, families wearing identification tags and waiting for transport. 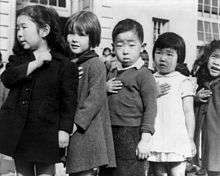 To many observers, her photograph of Japanese American children pledging allegiance to the flag shortly before they were sent to camp is a haunting reminder of this policy of detaining people without charging them with any crime. Her images were so obviously critical that the Army impounded most of them, and they were not seen publicly for more than 50 years. Today her photographs of the internment are available in the National Archives on the website of the Still Photographs Division, and at the Bancroft Library of the University of California, Berkeley. In 1945, Lange was invited by Ansel Adams to accept a position as faculty at the first fine art photography department at the California School of Fine Arts (CSFA). Imogen Cunningham and Minor White joined as well. In 1952, Lange co-founded the photographic magazine Aperture. Lange and Pirkle Jones were commissioned in the mid-1950s to shoot a photographic documentary for Life magazine of the death of Monticello, California and of the displacement of its residents by the damming of Putah Creek to form Lake Berryessa. The magazine did not run the piece, so Lange devoted one whole issue of Aperture to the work. The photo collection was shown at the Art Institute of Chicago in 1960. Another series for Life magazine which she began in 1954 featured Martin Pulich, a lawyer, due to her interest in how poor people were defended in the court system which by one account grew out of her experience with her brother’s arrest and trial. Dorothea Lange assisted her friend Edward Steichen at MoMA, in recruiting photographers for his landmark international touring exhibition The Family of Man, using her FSA and LIFE connections who in turn promoted the project to their colleagues. In 1953 she circulated a recruiting letter; “A Summons to Photographers All Over the World,” calling on them “show Man to Man across the world. Here we hope to reveal by visual images Man’s dreams and aspirations, his strength, his despair under evil. If photography can bring these things to life, this exhibition will be created in a spirit of passionate and devoted faith in Man. Nothing short of that will do.” Lange's work features in the exhibition, which was seen by 9 million people around the world. In the last two decades of her life, Lange's health was poor. She suffered from gastric problems, including bleeding ulcers, as well as post-polio syndrome – although this renewal of the pain and weakness of polio was not yet recognized by most physicians. Lange died of esophageal cancer on October 11, 1965, in San Francisco, California, at age 70. She was survived by her second husband, Paul Taylor, two children, three stepchildren, and numerous grandchildren and great-grandchildren. In 1972 the Whitney Museum of American Art used 27 of Lange's photographs in an exhibit entitled 'Executive Order 9066'. This exhibit highlighted Japanese internment during World War II. US President Franklin D. Roosevelt signed his Executive Order 9066 in February, 1942, which eventually allowed the deportation of Japanese-, Italian-, and German-Americans to internment camps. In 2006, an elementary school was named in her honor in Nipomo, California, near the site where she photographed "Migrant Mother". On May 28, 2008, California Governor Arnold Schwarzenegger and First Lady Maria Shriver announced Lange's induction into the California Hall of Fame, located at The California Museum for History, Women and the Arts. The induction ceremony took place on December 15 and her son accepted the honor in her place. On August 29, 2014, American Masters – Dorothea Lange: Grab a Hunk of Lightning premiered on the Public Broadcasting Service (PBS) network. Directed and narrated from a unique perspective by Lange's granddaughter, Peabody- and five-time Emmy award-winning cinematographer Dyanna Taylor, the film combines family memories and journals with never-before-seen photos and film footage as well as newly discovered interviews. A companion book, Dorothea Lange: Grab a Hunk of Lightning, by Elizabeth Partridge, was published in 2013 and is the only career-spanning monograph of Lange's work in print. ↑ "Corrina Wu, "American Eyewitness", ''CR Magazine'', Spring/Summer 2010". Crmagazine.org. Retrieved 2012-09-14. ↑ Durden, Mark. 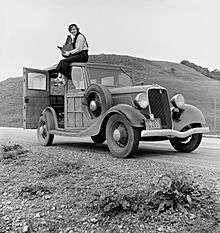 Dorothea Lange (55). London N1 9PA: Phaidon Press Limited. p. 126. ISBN 0-7148-4053-X. ↑ "Dorothea Lange". NARA. Retrieved 2008-06-29. Born in Hoboken, New Jersey, Dorothea Lange (1895–1965) announced her intention to become a photographer at age 18. After apprenticing with a photographer in New York City, she moved to San Francisco and in 1919 established her own studio. ↑ "Dorothea Lange". John Simon Guggenheim Memorial Foundation. Retrieved 26 August 2016. ↑ "Two women and a photograph". The Hindu. 1 2 3 "Dorothea Lange ~ Watch Full Film: Dorothea Lange: Grab a Hunk of Lightning". American Masters. PBS. August 30, 2014. Retrieved September 10, 2015. ↑ Dunne, Geoffrey (2002). "Photographic license". New Times. Archived from the original on 2002-06-02. ↑ "Hayward, California, Two Children of the Mochida Family who, with Their Parents, Are Awaiting Evacuation". World Digital Library. Retrieved 10 February 2013. ↑ Civil Control Station, Registration for evacuation and processing. San Francisco, April 1942. War Relocation Authority, Photo By Dorothea Lange,From the National Archive and Records Administration taken for the War Relocation Authority courtesy of the Bancroft Library, U.C. Berkeley, California. Published in Image and Imagination, Encounters with the Photography of Dorothea Lange, Edited by Ben Clarke, Freedom Voices, San Francisco, 1997. ↑ Alinder, Jasmine. "Dorothea Lange". Densho Encyclopedia. Retrieved 28 August 2014. ↑ Robert Mix. "Vernacular Language North. SF Bay Area Timeline. ''Modernism (1930–1960)''". Verlang.com. Retrieved 2012-09-14. ↑ BellaVistaRanch.net. Suisun History. Nancy Dingler, Part 3 – Fifty years since the birth of the Monticello Dam. Retrieved on August 17, 2009. ↑ Partridge, Elizabeth (1994). Dorothea Lange–a visual life. Washington and London: Smithsonian Institution Press. p. 26. ISBN 1-56098-350-7. ↑ Dorothea Lange, letter, January 16, 1953, quoted in Szarkowski, “The Family of Man,” 24. ↑ "Dorothea Lange Is Dead at 70. Chronicled Dust Bowl Woes. Photographer for 50 Years Took Notable Pictures of 'Oakies' Exodus.". New York Times. October 14, 1965. Retrieved 2008-06-29. ↑ "Trailer: Dorothea Lange: Grab a Hunk of Lightning". American Masters. Public Broadcasting Service (PBS). June 24, 2014. Retrieved September 10, 2015. ↑ "The Invisible Photographer Who Captured The Great Depression" (MP3 podcast and video). The Leonard Lopate Show. WNYC. August 26, 2014. Retrieved September 10, 2015. Gordon, Linda; Okihiro, Gary Y., eds. (2006). Impounded: Dorothea Lange and the Censored Images of Japanese American Internment. New York: W. W. Norton and Company. ISBN 0-393-33090-7. Wikimedia Commons has media related to Dorothea Lange. http://lacrossehistory.org/literature/cached/DorotheaLange.pdf, David Joseph Marcou's Oct. 2009 article with endnotes 'Migrant Mother, Florence Thompson' and the 'Nisei Internees'.